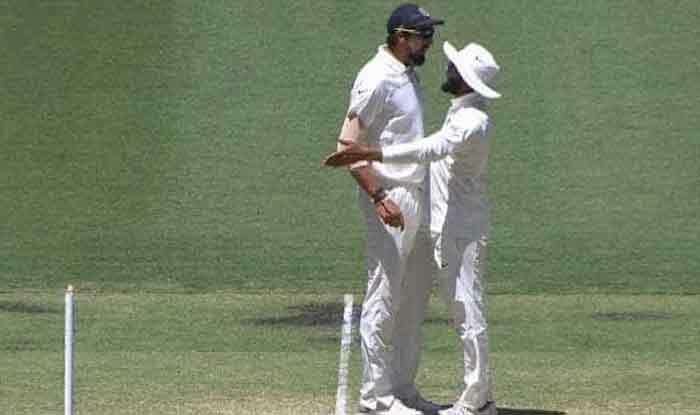 In a recently concluded second Test match between India and Australia, Ishant and Jadeja were engaged in a heated discussion during a mid-game break of the fourth day. The incident happened when Australian spinner Nathan Lyon was having his helmet checked after a blow he got, on his head, in Australia's second innings. The video got aired on the final day but without any audio in it. Meanwhile, a team spokesperson said, "The Indian team management clarifies that the incident between Ishant Sharma and Ravindra Jadeja was in no way a 'fight' and happened at the spur of the moment on the field. The management confirms that all is well between them." However, the stump mics picked up their conversation and was accessed by ESPNcricinfo. India vs Australia: In a recently concluded second Test match between India and Australia, Ishant and Jadeja were engaged in a heated discussion during a mid-game break of the fourth day. The incident happened when Australian spinner Nathan Lyon was having his helmet checked after a blow he got, on his head, in Australia’s second innings. The video got aired on the final day but without any audio in it. Meanwhile, a team spokesperson said, “The Indian team management clarifies that the incident between Ishant Sharma and Ravindra Jadeja was in no way a ‘fight’ and happened at the spur of the moment on the field. The management confirms that all is well between them.” However, the stump mics picked up their conversation and was accessed by ESPNcricinfo. We witnessed a lot of banters in both Test matches, be it Virat Kohli-Tim Paine fiery exchange or Rishabh Pant sledging to Pat Cummins. The four-match series is leveled by 1-1 and the third Test is scheduled on the 26th December, which will be played in Melbourne.